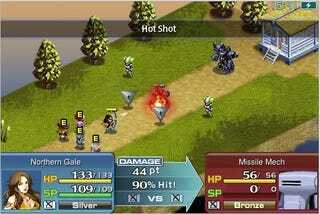 Song Summoner was one of the few games released for the iPod-not the touch, but original clickwheel type. It was special, as a game, because it used your own music to procedurally generate enemies. Now, it's on the iPhone. It's $10, but it's an RPG, which supposedly implies more gameplay hours than non-RPGs. Even when you're not actually playing the game, you can level up your guys by listening to the music that's bound to each character, giving you an added bonus to use your iPhone/iTouch more. It's a Square Enix title, so production values and story are top-notch. Try the free version first. Twitter 360 is the first augmented reality Twitter app to support the official API, and it looks fantastic. Previously, the only way to grab location data from Twitter was to scrape through user profiles or to rely on some kind of third-party geodata service, with which Twitter users could upload their current locations as individual Tweets. It worked, sort of, but it was janky and awkward. Now that Twitter lets you embed your location in each tweet without taking up any characters, things are different. It's $3, which seems a little high considering free apps like Layar will soon provide similar functionality, but the interface is slick, and the concept is straight out of an episode of Beyond 2000. Knocking Live: Knocking Live for photos was interesting, if a bit narrow in scope—it let you share photos with other users, and conduct slideshows remotely. Useful, sure, but you've sort of got to explain it, you know? Knocking Live, on the other hand, will resonate instantly with most people. It's a video sharing and viewing app, which lets you connect to other iPhones and see whatever their cameras see. It's like slightly less than half of a video call! And this one was (allegedly) shepherded though the approval process by Steve Jobs himself, which has to mean something, right? Free. Fring: Which brings me Fring, which is exactly half of a video call, via Skype. It looks like Apple's gotten more lenient with access to certain private video APIs this week, so expect more interesting broadcasting apps in the near future. Free, and it happens to be a rather awesome instant messaging multi-client, too. Twitter apps, in general: Twitter keeps growing new little tumors features, but the progress is slow enough that Twitter apps can usually keep up. The last few weeks, though, have seen a lot happen: Twitter lists, native geolocation and official retweet formats have all graced the service, and thrown apps into confusion. The new version of Tweetie, probably the best iPhone Twitter app out there, now handles all of these, while the latest update to Birdfeed, the prettiest iPhone Twitter app out there, does geolocation and Flickr support. Both are free as upgrades, and $3 to new buyers. ESRB: A quick, free videogame ratings reference for parents, to protect their children from terrible death games, and fun. iGAAUGE: A kindly app for people who own a car, but have no idea how it works. iGAAUGE, which has a name that looks like it should always be shouted, gives you guesses at what's wrong with your car, based on the common symptoms you supply it. It's not going to help you swap out a crankshaft, but it'll give decent, obvious advice, and if al else fails, tell you where the nearest AAMCO is. It does traffic reports, too! Free. 360 Live: Sign in to your Xbox Live account, chat with people, browse stats and do whatever else you shouty, occasionally racist folks I have to listen to whenever I'm playing Battlefield 1943 do on there. Two dollars. Stitcher: Stitcher, which "stitches" together tailored, recommended radio content from a variety of sources (NPR, MSNBC, PRI, etc) to create an effectively unlimited supply of talk that you'll probably like, now streams live content, too. The app was more than worthwhile before this update; now it's a must-have. Free. MiniSquadron: An artistically inspired sidescrolling 2d shooter, MiniSquadron is a much larger game that it looks. Tons of weapons, fast-but-not-frustratingly-so gameplay, and wonderfully smooth animations make the game a worthy purchase. And while we're on games, a note on Monkey Ball 2: It's not included here because apparently it's crashing like crazy on 3GSes, which is a pretty serious issue for a $10 app. An even though it costs a third as much, I have feeling I'll get more enjoyment out of MiniSquadron in the long run, anyway.